A whole process happens in just Micro-Seconds ! To best describe the process happening in a typical flash circuit, we have made an animation showing it in steps. The light output of a flashtube is a function of the electrical energy stored in the storage capacitor. So actually the flashtube rating is for MAXIMUM allowed input energy, and can be powered by any value between zero (0) and the maximum allowed energy. Remember: to increase the light output, you need to increase the stored energy ! that at higher flash rates the energy per flash must be reduced. 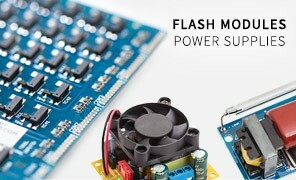 To keep the flash duration low, you will need to select low-impedance components, including the storage capacitor and the wiring to the flashtube. Another way is to choose a high energy density flash tube, which means a relatively short arc and thick tube, rather than a long arc and thin tube. But most importantly, you will need to use the basic rule that says the bigger the capacitance, the longer the flash duration. But how to keep the flash energy high, if we lower the capacitance ? the Input Energy formula tells it all ! We need a higher voltage. As said before, you should choose the flashtube for your project according to your input energy, leaving some headroom for safety and for prolonging the flashtube’s life duration. Flashtubes exist in many shapes and sizes, including Linear, Round, Helical (spiral), U-shape (horse-shoe) and more. It all depends on your application and product design. Keep the wires connecting the flashtube to the storage capacitor the shortest and thickest possible. The discharge current usually reach a several hundreds of Amperes. You are working with high voltage. Always keep the circuit well insulated. Never work on the circuit before you safely discharge the capacitors.